In the last Bosnian presidential election, in 1990, Abdic won the most votes. But he let Alija Izetbegovic head the collective presidency. As far back as 1983, Izetbegovic had been jailed by the government of Yugoslavia for inciting Muslims against non-Muslims in Bosnia. Alija Izetbegovic, who had been released early from jail in 1988 (serving only six years of a 14 year sentence for pro-Islamic anti-state activities), visited Islamic fundamentalist states in the Middle East, returning to Bosnia-Herzegovina to found the SDA (Muslim Party of Democratic Action). His 1970 manifesto, "Islamic Declaration", advocating the spread of radical pan-Islamism-politicised Islam-throughout the world, by force if necessary, was reissued in Sarajevo at this time. His Islamic Declaration is imbued with intolerance towards Western religion, culture and economic systems. This is also the theme projected in his book, Islam between East and West, first published in the US in 1984, and in Serbo-Croat in 1988, shortly after he was released from prison in the former Yugoslavia. In his writings he states that Islam cannot co-exist with other religions in the same nation other than a short-term expediency measure. In the longer term, as and when Muslims become strong enough in any country, then they must seize power and form a truly Islamic state.In February 1991 he declared in the Assembly: “I would sacrifice peace for a sovereign Bosnia-Herzegovina, but for that peace in Bosnia-Herzegovina I would not sacrifice sovereignty.” To the Serbs this was a war cry. In March 1992, a peaceful solution for Bosnia finally seemed to be within reach. All three Bosnian leaders (Alija Izetbegovic/Muslim, Radovan Karadzic/Serb and Mate Boban/Croat) signed the so-called Lisbon Agreement, which proposed ethnic power-sharing on all administrative levels and the delegation of central government to local ethnic communities. However Izetbegovic withdrew his signature only ten days later, after having met with the U.S. ambassador to Yugoslavia, Warren Zimmermann.A few weeks later, war broke out…….. 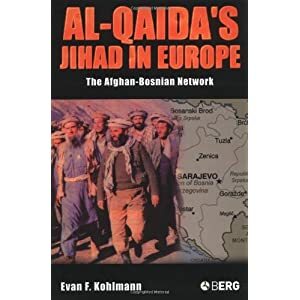 This much is known: Several thousand foreign mujahedin from the wider Islamic world fought on the Bosnian Army’s side during the 1992-1995 war, and Al Qaeda was closely involved in their transport and activities there.But Bosnia wasn’t a jihad, right? And all those charges of ‘mujahedin’ presence were just vicious serbianationalist propaganda, right?In fact, Bosnia and Kosovo weren’t jihads only in the eyes of the West.The hidden “Islamic jihad” in Bosnia was covered up because this suited the needs of interested parties and it was not productive to show America, Alija Izetbegovic, Al-Qa’ida, the global jihadist network, and other nations, working hand in hand. Therefore, the “Muslim victim card” was played and the same applies to re-writing history. The Serbians, who had been the victims of Islamic jihad under the Ottomans and then suffered so brutally under the Ustasha/Nazi/Islamic collaboration during World War Two, were once more victims, just like they had been under the Habsburg Empire, because during the 1990s it is clear that the mass media sided with all anti-Serbian forces. This applies to supporting Croatia, the Muslims of Bosnia, and the Albanian Muslims of Kosovo. The world belongs to Allah:Qur'an: 8:39 "Fight them until all opposition ends and all submit to Allah."